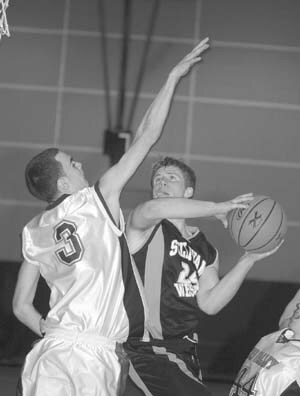 SULLIVAN WESTS SEAN Kelly drives to the hoop against Tri-Valleys J. R. Rennison in Sundays title game. LOCH SHELDRAKE  December 23, 2003  Despite a spirited Tri-Valley Bears defense, it was like a walk in the park for the Bulldogs of Sullivan West as they blasted the opposition, 70-43, Sunday afternoon on the way to being crowned champions of the Sullivan County Community College (SCCC) High School Holiday Tip-Off Tournament. The Bulldogs came out charging and took a commanding 40-20 lead at halftime. Sullivan West (5-1) had two hoopsters attain double figures: Sean Kelly (a game-high 29 points) and Joe Meyer (14). For T-V (3-4), Martin Henry-Lester, a 67 senior center, scored a team-high 20 points. SW went 6-of-12 (50 percent) from the free-throw line, while T-V was 6-of-14 (43 percent). The 2003 All-Tournament Team included: Doug Novogrodsky (Fallsburg), J. R. Rennison (T-V), Meyer (SW), Henry-Lester (T-V) and Brian Parks (SW). Kelly, a junior forward for the Bulldogs, was named MVP of the tournament.